By Liz Black, University of York and Steven Fawkes, ALL. 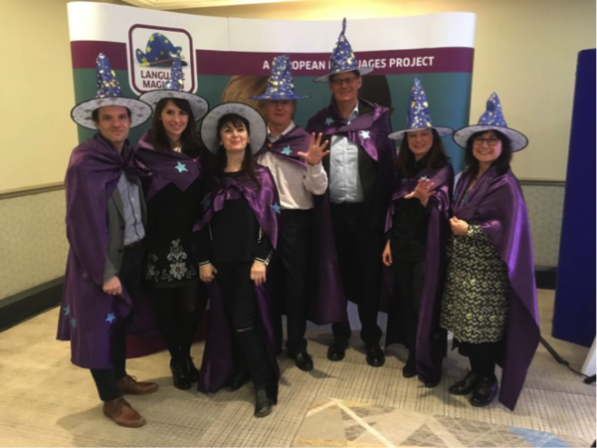 The Conference included a Major Talk about the game, a linked session on Assessment, a Game workshop session and the launch event itself on Friday evening, attended by a gaggle of Magicians from THE LANGUAGE MAGICIAN team wearing cloaks and hats and carrying prizes in a cauldron! 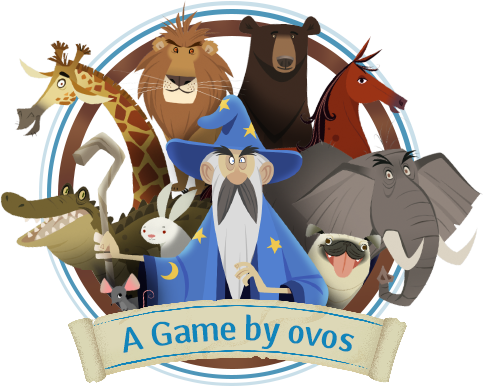 All to celebrate the launch of the online game – ahead of schedule – as if by magic! The assembled Language teachers all joined in with the multilingual spell created for the occasion – to ensure a magical weekend! The Twitter activity surrounding the Conference was huge – and the Team counted as many as 150, 000 Tweet and retweet contacts around #LMagic! This takes the dissemination reach of the project throughout its development to over a million at the time of launch! On the second day of the conference THE LANGUAGE MAGICIAN team members were congratulated by lots of the people attending who were so impressed by the design, the planning, the range of resources and the look of the game. Specialist and non-specialist Primary language teachers (and Secondary colleagues) were really complimentary, and looking forward to introducing it to other teachers. Steven emphasized the importance of engaging pupils and maintaining their motivation throughout their learning, without losing time for stressful or extraneous assessment, a point supported by the Project researchers below. In this Major Talk session were more than 20 of ALL’s volunteers from local Primary Hubs around the UK who took away a version of the presentation to use in their own context in coming weeks, as listed here, in order to spread the word to practising teachers of how to get set up to use the game to enthuse their pupils. As the Erasmus+ project draws to its close the team feels very encouraged, especially by the extremely positive response at Language World where delegates from many language communities shared their hopes and dreams for this innovative game, feeling that the non-threatening way of recording pupil progress in the different skill areas could have a very motivating impact. It was notable that, in contrast to a presentation by Louise Courtney and Suzanne Graham on research findings last year, when Louise told delegates that ’by the end of the first year of secondary school less positive attitudes towards learning French and less optimism about the possibility of future progress were beginning to emerge’ the reverse now seems to be true. Suzanne commented in her recent article that ‘.. the underpinning approach of the LANGUAGE MAGICIAN … gives learners a clear sense of making progress within a communicative, game-based context. In our pilot study for the LANGUAGE MAGICIAN we have been using an adapted version of the questionnaire we designed for the Nuffield project, to explore how learners in all the countries involved feel about language learning as well about the game itself, with very positive findings to date.’ There is of course ongoing concern about transition in language learning from the Primary to the Secondary phase but such findings must make us all feel more positive. Trials with pupils of different ages in Tenerife and in Germany have also yielded excellent findings, and everyone involved in the project feels that it could have a great impact in terms of teaching and learning in the primary school systems in all of the countries involved and further afield too. A number of conferences across Europe have already disseminated such research findings (and details of the game itself) to head teachers, teachers and language advisors, whose support is essential, as ultimately it will be individual teachers in classrooms who will make the most of the THE LANGUAGE MAGICIAN and its impact on pupils’ confidence and progress. And now to ongoing plans and hopes for the future! As well as the primary hub coordinators in Britain training primary teachers in how to get the most from the game and its accompanying resources in the coming months, there are plans already in place for CPD in other partner countries, and the partners hope that success stories from schools across the continent will be shared widely. The team from Germany led by Norbert Schlüter at the University of Leipzig report that they have already gained a wider perspective of education systems and that they hope to continue to support and expand on this valuable work by analysing the data of thousands of pupils across Europe who have played the game. The partners in CEP Norte agree and feel that organising the results in a visual way will mean that a greater number of teachers will be able to use the information gathered to inform their future planning and maintain the pupils’ motivation for learning a language. 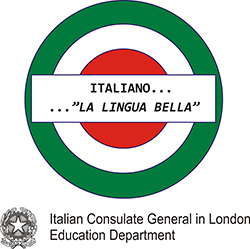 THE LANGUAGE MAGICIAN team is now looking forward to hosting the Final Conference of the Project at the University of Westminster in London on Saturday 19th. May 2018, at which point all of the accompanying project resources will be available. Highlights of this event will include individual language sessions with a detailed introduction to the Classroom Resources and the Speaking Module and chance to play, as well as a Culinary session to end the day! Details are on THE LANGUAGE MAGICIAN website.